(Dec 2006) IFC Nederland (Dutch). (Sep/Oct 2005) Issue 36 PCPILOT Magazine (English). (Dec 2004) SimFlight network MSFS Add-ons - Shopping Guide 2004 (English). (Jan/Feb 2004) Issue 26 PCPILOT Magazine (English). (Oct 2003) Taxiway.it website (Italian). Sept 2003 Review in simflight.de website (German). (August 2003) Unicom Radio Jet Doctor review (Show #8 08-30-03). (August 2003) The Jet Doctor website (English). (July 2003) Taxiway.de website (German). 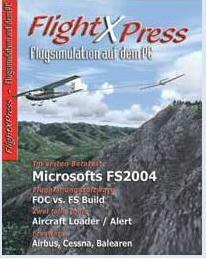 August 2003 Issue of FlightXPress magazine (German). January 2003 Preview in simflight.de website (German).